Before the time of Christ the local Ancient Britons, the Cantiaci would have settled in small clusters of Round Houses all over Kent and it is quite possible that one such community was close by to take advantage of the natural resources of trees, field and stream. The names Kent and Canterbury come directly from these tribesman. In 54BC Julius Ceaser invaded Britain and perhaps his men passed this way on route to London, and although he went away the Romans came back in 43AD under Claudius. One permanent feature they created was the road. The descendants of the earlier British locals still living in Round Houses would have used the road to trade more widely than they had before, not just with Canterbury but to Gaul (modern day France) and London. After 400 years the Roman Empire failed and the Roman way of life collapsed in East Kent when Hengist the Jute became King in Kent, thereafter there where decades of war across southern Britain. 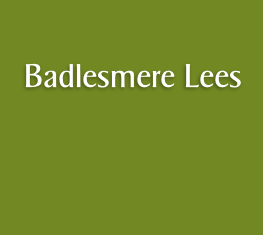 At some stage the Jutes settled here and Badlesmere was named 'the mere (meaning river) belonging to Baeda (a jutish person), also another called Leofa settled the Lant or land the other side of the Road and this become the modern Leaveland. Despite these changes the day to day farming and fishing continued, the Jutes probably marrying local girls and the houses became rectangular. These men of Kent, being east of the Medway, saw the development of a prosperous kingdom and Faversham only a few miles away became a centre of craft and trade many beautiful swords and buckles have been found. In the 800's the real threat of the Vikings appeared. The Norsemen, or Northmen went a 'vikingr' meaning to voyage, trade and raid. They over ran the whole of England and locally they often took over the Isle of Sheppy and raided the countryside. Eventually they were beaten back and Kent fell under the rule of the Kings of Wessex who later became English Kings. Later in the early 1000's the whole of Kent was taken and ravished by the Danes and Canterbury was burnt and enslaved. Badlesmere may not have faired any better. The Viking threat was soon to be replaced by the Norman Invasion under Duke William who defeating the last English King Harold at Hastings became the English King at Christmas 1066. Badlesmere and Leaveland were given to Odo, the brother of William and Badlesmere was recorded in the Doomsday Book, the book that set down the villages worth so it could be taxed. Badlesmere was taxed but Odo was at odds with William and the area was given over to another Norman Family. In the Reign of Edward the First, the Hammer of the Scots, Baron Gunslem de Badlesmere rose to power and fought for Edward in his wars, Bartholemew de Badlesmere his son also rose in Rank and became Baron on his fathers death. Bartholemew had many castles all over England and locally held both those at Chilham and at Leeds. Edward the First died and his weak Son Edward the Second became king at first he relied on Bartholemew, but Bartolemew joined a revolt against him and this led to the Siege of Leeds Castle in 1321 whilst he was in the North. Bartholemew was caught at a another battle and beheaded with his head being put on display on the wall of Canterbury. Shortly after this Edward the Second was killed and his son Edward the Third became king. Edward the Third gave Badlesmere to one of his loyal men, the Earl of Oxford and the heirs have held the land since then. The Earl of Oxford fought all over France with the King and the Black Prince, in the 100 years war. He died in front of the city of Reims. Later in the 1400's Leaveland came by marriage to the Lord Poynings from Sussex and the late 15th century the Manor of Badlesmere was granted to the John Wrythe the Garter King of Arms. Who worked for Edward the fifth, Richard the third and their opponent in the War of the Roses, Henry the Seventh.